It has been a little more than 6 years that the Senguptas have shifted to their current apartment in Mumbai, and it was only during their shifting that the house was painted. So repainting their house has long been on Mrs. Sengupta’s mind. The only problem is that Mr. Sengupta has been dilly-dallying with the idea. But now that Durga Puja is approaching and Ganesh Chaturthi is just around the corner, Mrs. Sengupta is pretty determined and her husband has also finally agreed to get the home painting done this year. After all, the festive season is knocking on the door and their relatives and friends will be coming over. The problem is, both of them are equally confused about where to begin. If you also find this situation relatable, here are the best home painting tips for your home. What are the Home Painting Options Available? Firstly, when it comes to selecting the paint, there’s a wide variety for you to pick from. There are water-based and oil-based paints as well as interesting textures and finishes to create magic on the walls of your home. Water-based paints are great for almost any kind of surface. These are easy to maintain and use, and retains the tint for the longest time. You can easily clean the walls with water and it dries up quickly too. There will be no need to pre-treat the walls before painting them using water-based paints. If you want to attain a rich finish, then oil paint will be the best choice. Oil-based paintings take a longer time to dry up and are extremely resilient in nature. These are best suited for kitchen and bathroom, where the level of exposure to moisture is very high. However, the strong odour of oil paint might seem too overpowering initially. When it comes to choosing the finishing, it gets really interesting! You can select from plain to highly textured finishes, depending on your choice. Starting from eggshell, matte and satin-like to velvety smooth and metallic or even rough finishes – you will be spoilt for choices! With the market flooding with choices, it can be a daunting task to pick the right paint. While you may be looking at the colours, textures, and finishes, it’s a better idea to also consider some functional benefits — especially so because now there are plenty of different choices when it comes to functional paints and coatings. Let’s look at some of them. If you wish to go for home painting that involves low maintenance, then water-based paints are definitely the way to go. But if you don’t mind putting in the extra effort to keep your walls super clean, then choose oil-based glossy paints. Moreover, this variety offers a more protective coating to the walls and looks marvellous too. The smell of oil-based paints can cause a lot of discomfort to all those who are prone to breathing troubles. For greater safety, the brand new range of water-based VOC-free paints would be the best choice. Paints that are low on Volatile Organic Compounds, help in maintaining a healthier air indoors and are therefore highly recommended. For the walls that are exposed to the various weather elements, going for weather-coat paint will make sure that the damaging effects are minimized. These types of paints typically act like a protective layer over the walls, guarding it against the harshness of prolonged exposure to the sun and rain. You might also like to check out wall paints that are waterproof. Dampness in the walls can cause a great deal of harm and even make the walls crumble down if left untreated for long. 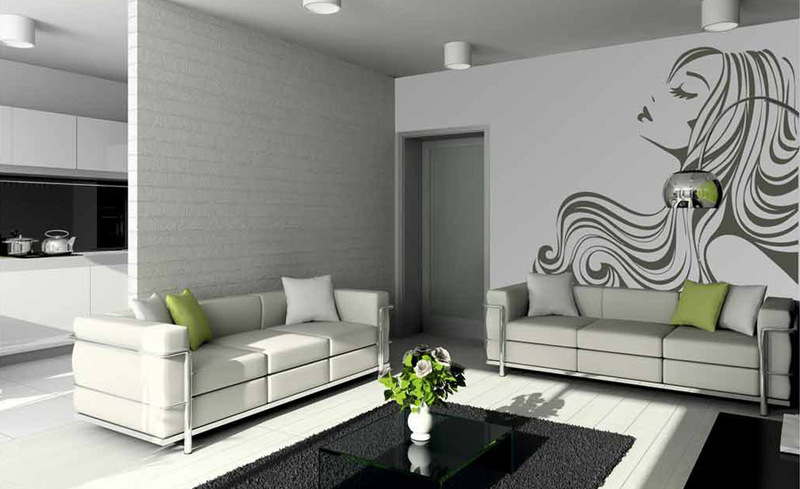 To make sure that your walls do not retain water and dampness, go for the water-repellent wall paints. Now, here is where you need to strike a fine balance between your desires and practicality! But to make things easier for you, here are the three main factors to consider when you are selecting the right shade of paint. Existing home furniture and upholstery – Look around you and think of all the colours that appeal to you the most. Then out of all those, think of the ones that will blend beautifully with your furniture. If beige, white or tan are the predominant shades in the room, then a neutral colour on the walls will be ideal. Room size and light conditions – Smaller rooms when painted with lighter colours, offer the illusion of a larger space. Moreover, lighter shades of paint can brighten up the look and feel of any room. Purpose of the room – Whether it is the study or your kitchen or the bathroom, also goes a long way in deciding the shade. While cooler shades are great for bedrooms, pick something other than white for the kitchen. How to Experiment with Paint? Playing around with colours and textures of wall paint is something that has garnered a lot of popularity today. For instance, you can go for a textured wall paint that coordinates perfectly with the shades on the mattress of the living room or the patterns on the dining table. Or maybe a dash or two of glossy paint on the same shade of matte paint will look quirky but out of the ordinary. However, if you dare to step out of the ordinary, you must definitely try the decorative paints. Right from transforming the original texture of the walls to creating some work of art, decorative paints can help you unfold a vibrant world of dreams within the four walls of a room. It is no wonder why decorative wall paints enjoy the lion’s share in the industry today! From crackled finishes and suede smooth walls to prints, designs, stones, metallic sheen and even DIY textures; the options to experiment with ornamental wall paints are boundless. If you wish to bring out your artistic sensibilities and impress with your sense of aesthetics then these home painting tips will get you started on the right foot. Here is your chance to let go of the boredom from the same shades in your décor. Instead, you can stir up quite an ambience with rich and remarkable wall colours that can do every bit of justice to the festive cheer. Great article! Thanks for sharing an informative article! Should Children be Given Importance While Buying a New Home?